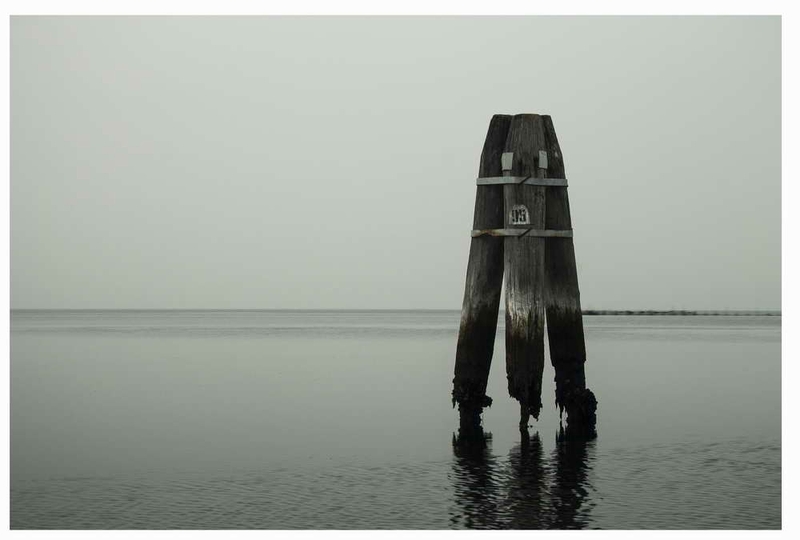 The films are compiled from photographs of the channel markers used to delineate the waterways across the lagoon around Venice, leading to and from the city. 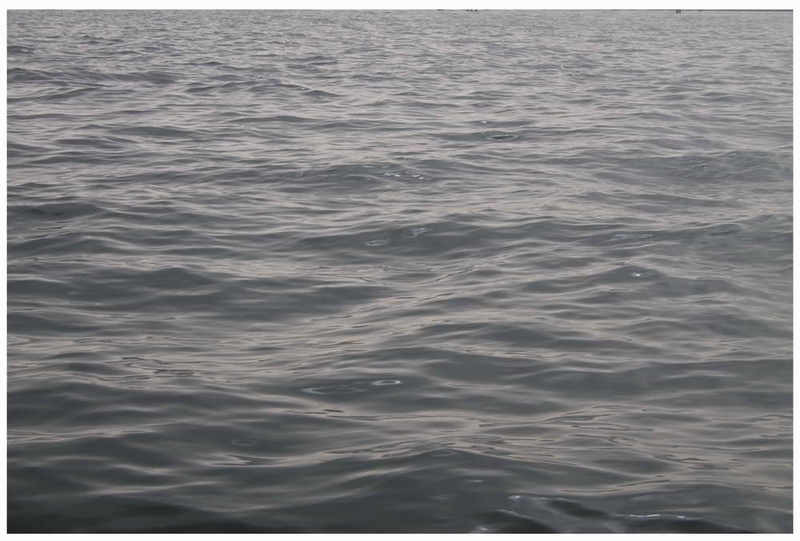 By linking the photos into a video sequence, the wooden structures become animated, and seems to be a living organism moving over the water. The films depict different routes in and out of the city, at different times of day, in different weather conditions. Some depict the marker from close-up, some from far off. The idiomatic expression 'stick in the mud' refers to a person who is slow, old fashioned or unprogressive. 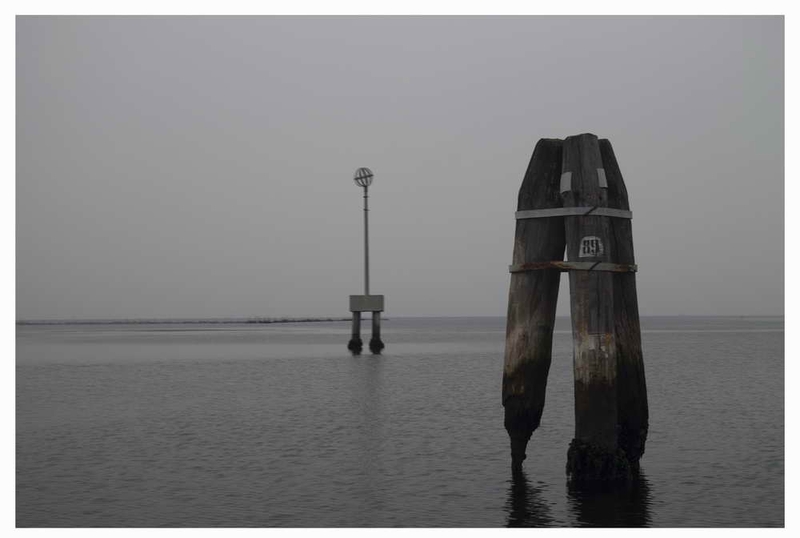 Venice, literally being built on ‘sticks in the mud’, and using ‘sticks in the mud’ to guide us in and out of the city, literally needs this idiomatic slowness – the stability, the unwillingness to move or change, for its functioning and survival. The artist photographs hundreds of stable, unmoving ‘sticks in the mud’ and string these individual images together to create a film. Relying on their slight differences – the proof of their individuality - to create the illusion of movement, the artist creates the idea of the sticks as a single living creature, moving across the lagoon, walking on water. The concept of the stable, unmoving ‘stick in the mud’ is thus juxtaposed with the method of creating the artwork, which needs the instability of movement and change. “To me the city has become a deconstructed film, its separate, individual frames scattered across the lagoon. I attempt to put them together again so people can see the city for the living creature it is. I want people who have seen the films never to look at those channel markers again without seeing them move”. The installation formed part of the exhibition JUMP INTO THE UNKNOWN, an official collateral event of the 56th Venice Biennale, presented by Nine Dragon Heads, an international community of artists, which explores and re-considers the relationship and equilibrium between people and the natural environment.